A Concierge Club-Level welcome gift, and printed in gold-leaf these boxes were convert from the ‘90s “Polynesian” Logo to the “Village” version with emphasis on the Resort’s Maui mascot. All Deluxe Resorts and DVC properties at Walt Disney World have some version a DVD lending system for their Guests, nearly all of these are issued in bank cases. 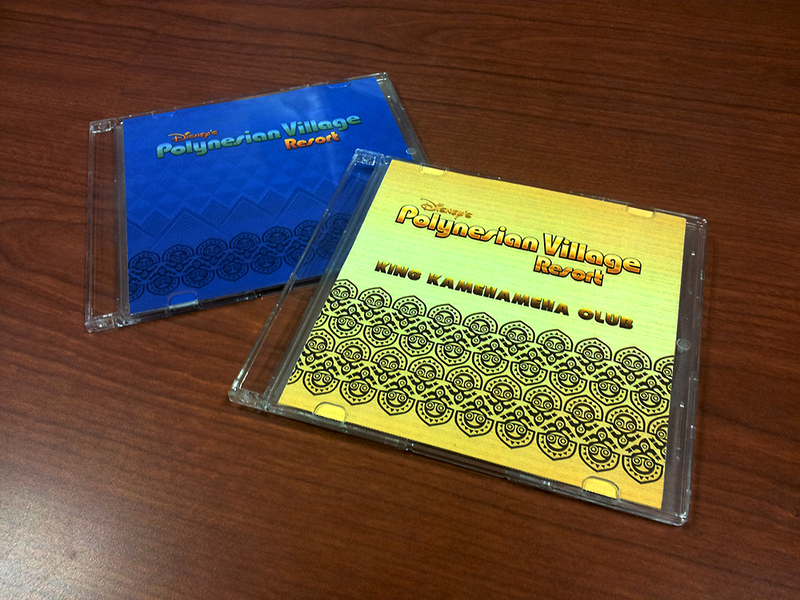 The Polynesian Village is the only property to feature custom designed cover art with two versions…. The Concierge Club version focuses on the history and opulence of the resort with a gold-based color scheme and background texture similar to the original 1971 check-in folders for the hotel. The DVC version emphasizes the new color scheme and graphics created for the resort with a specially background pattern based on the iconic gable pattern on the resort’s longhouses. Created for internal (backstage) use, several holiday variations of Maui icons were created for Halloween, Thanksgiving & Christmas. Under the guidance of our Walt Disney Imagineering, Art Director the Halloween Version was redesigned and is planned for use in Trader Sam’s “Mahaloween” events this year. As part of the rebranding of the resort, new letterhead was need and would no longer be provided to the resort. Therefore, I was tasked to create several variations for multiple uses. An example of customizable design, the original version of these were printed on cardstock, laminated and then cut into individual labels. This method was not only time consuming, but the cards themselves deteriorated quickly. Intend for short outages of equipment/faculties, this stylistically consistent template can be used for a variety of situations/communications, and incorporates our smiling mascot in the hopes of psychologically softening the blow during the inconvenience.